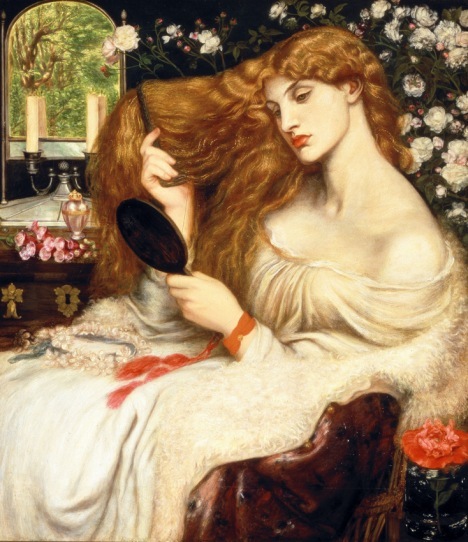 “Pre-Raphaelite art is a volatile, highly complicated mixture of questionable intentions, literary erudition, ironclad nostalgia, meticulous realism, lavish costumes and a prescient technicolor palette. The brotherhood was formed in 1848 by William Holman Hunt, John Everett Millais and Dante Gabriel Rossetti, three disgruntled students at the Royal Academy of Art. Barely 20, they were repelled by the decadence of art and society, much of which they ascribed to the Industrial Revolution. “They wanted to turn back the clock to purer, more thoroughly Christian times…At once hysterical and inert, these paintings are fascinating as artifacts, period pieces reflective of their time. If you want a clear idea about what was rotten as opposed to enlightened about Victorian England, look no further.” Read more. The key line in Roberta's review is "impossibly beautiful" women. one of the only taboos in the Pan-Judeo- Protestant-Lite, Modernist intellectual paradigm is anything that disrupts the shift away from Christianity in the post renaissance era. My Laura Krifka show opens on April 5th (bravinlee programs), because of her show, this subject, how to deal with evangelical Christianity in a modernist way, has been on my mind. Roberta's comparison to Manet is fair enough if too obvious. Not every painter has to be compared to one of the Michael Jordans of 19th century painting and culture to be considered valuable and interesting and most importantly impossibly beautiful. It is hard to imagine looking at a whole show of this stuff without needing to go outside to adjust one's eyes.